GOSHEN, Ind. – A pony-powered environmental lawn-mowing service established Kathryn Birky as a socially conscious entrepreneur when she was only 12. And this year, the business plan for the service helped the Goshen College sophomore win a $24,000 young entrepreneur scholarship. The award, given annually by the National Association for the Self-Employed (NASE), is a national prize for a student who shows interest and promise in entrepreneurship. Birky, a communication major from Glenn, Mich., demonstrated both aptitudes when she and her brother began researching environmentally friendly ways to mow the lawn six years ago. 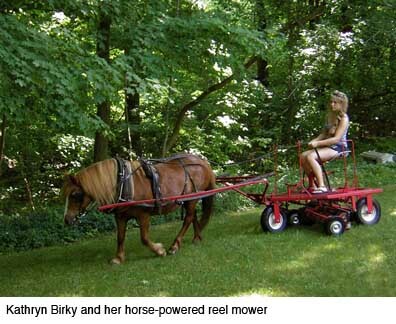 They decided to try a horse-powered reel mower, a type of non-motorized mower normally sold to the Amish. “We enthusiastically purchased a pony named Clementine, built a barn and took driving lessons,” Birky wrote in the essay describing her business plan for the scholarship competition. After advertising the service with flyers explaining the advantages to mowing without using gasoline, Birky said, “We accepted as many lawns as Clementine could handle.” They have kept the business going every summer since. Her success at raising social awareness while launching a business became apparent in its first year and continued. “When I began mowing lawns with a pony, I was simply attempting to respect the earth with my decisions. Since then, I have seen it grow in ways I never imagined,” she wrote in her essay for the scholarship. Soon their small but unique business operation was receiving national attention with stories in “The Detroit Free Press” and “The Boston Globe.” Then a Canadian author mentioned the business in her book and Birky and her brother met the governor of Michigan. For Birky, it was especially rewarding that the attention influenced others to seek alternatives to gas-powered mowers. Duane Stoltzfus, professor of communication, has observed Birky and her work in the classroom. “Fortunately for those around her, Kathryn is determined to use all the daylight hours she can to do good in the world,” he said. Birky continues to have high aspirations. Though she doesn’t plan to continue the mowing business, her values haven’t shifted. She hopes to be an independent environmental writer, believing: “If I can convince individual readers to make their everyday decisions with this awareness in mind, their united actions will create a greener world and a brighter future. “An entrepreneur is a visionary: they see opportunities for improvement in a society that other people haven’t noticed yet,” she said. She is already on her way to achieving this, having won the scholarship. Anyone across the nation who is a child of a NASE member can apply for the award. NASE, an organization that provides resources, benefits and support to help self-employed people suceed, has approximately 250,000 members. Birky’s current entrepreneurial endeavor holds potential for her continued success. She is working with a publisher on her first book, called “Friendship with Horses,” information for teens about training horses.